"Why do people think they can mess with Bronx women without getting roasted?" 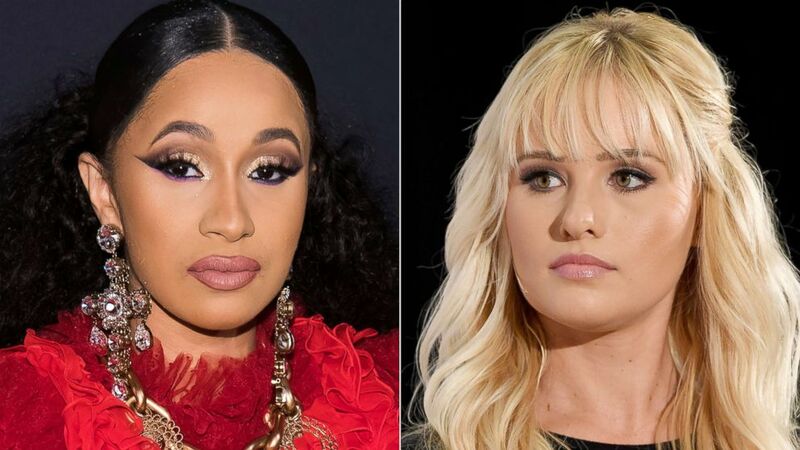 Tomi Lahren insulted Cardi B's intelligence on Twitter and it went about as well as you might expect, with ripple effects prompting a subsequent feud between Lahren and a member of Congress over the weekend. "Looks like @iamcardib is the latest genius political mind to endorse the Democrats. HA! Keep it up, guys! #MAGA2020," the outspoken conservative commentator tweeted on Wednesday. Lahren, who is a supporter of President Donald Trump, appeared to be referencing an expletive-laden video Cardi B shared on social media last week wherein the rapper criticizes Trump and expresses fear over the government shutdown -- which is now the longest in U.S. history. The rapper fired back on Sunday, tweeting, "Leave me alone I will dog walk you." (Michael S. Schwartz/Getty Images) Tomi Lahren speaks onstage at Politicon 2018 in Los Angeles. This prompted debates on social media about the meaning of the term, with some pointing to an Urban Dictionary definition: "When you’re beating someone’s a-- and you’re dragging them as if you were walking a dog." Lahren, who is a Fox Nation host, doubled down with a second tweet insulting the Grammy-winning rapper's intelligence, writing, "I’m sure you would. Still doesn’t make your political rambling any less moronic. #BuildthatWall." Cardi quickly clapped back with an insult of her own, accusing Lahren of being a "sheep" -- someone who follows others but can't think for themselves. (AP/Getty Images) Cardi B attends an event on Sept. 7, 2018, in New York.| Tomi Lahren speaks on Oct. 21, 201,8 in Los Angeles. "You’re so blinded with racism that you don’t even realize the decisions the president you root for is destroying the country you claim to love so much .You are a perfect example on no matter how educated or smart you think you are you still a SHEEP!" the "Bodak Yellow" rapper tweeted. Cardi's response appeared to please another firebrand on Twitter -- Democratic Rep. Alexandria Ocasio-Cortez, who became the youngest woman elected to Congress in 2018. "Why do people think they can mess with Bronx women without getting roasted? They act as though our borough hasn’t been perfecting the clapback game since the Sugarhill Gang ?? y’all just found it on Twitter," the congresswoman wrote. Cardi B, whose full name is Belcalis Marlenis Almánzar, was born and raised in the Bronx, and Ocasio-Cortez represents the eastern part of the borough. Lahren, who appeared to be referencing Cardi's "dog walk" comment, accused the congresswoman of applauding violence. "Aren’t you the same girl who whines about Trump inciting violence? Now you applaud it because it’s against a female conservative you disagree with politically? Convenient. P.S. I do fully acknowledge @iamcardib is smarter than YOU," Lahren wrote. Ocasio-Cortez's response was to Cardi's tweet referring to Lahren as a "sheep" and not to the tweet where the rapper said she would "dog walk" Lahren. ABC News has reached out to the congresswoman's office, but a request for comment was not immediately returned.